I've read so many articles about the benefits of body brushing over the years, but for some reason I've never got round to trying it out for myself. So, after spur of the moment purchase in The Body Shop, I couldn't wait to see if the claims were true. This round brush was only £8, but you can get a long handled one for a couple of pounds more. I've been trying out body brushing before each shower for around 2 weeks now - so obviously I can't say any long term benefits yet! - but I've been so impressed I thought I would share my findings so far. The idea is that you brush your dry skin in circular motions towards your heart, preferably before a shower or a bath, as it brings all the blood to the surface of the skin and opens the pores. You can brush for anywhere between 2 and 20 minutes, but I usually just do a quick 5 minutes before a shower. It leaves me feeling really energised too, so great for mornings. 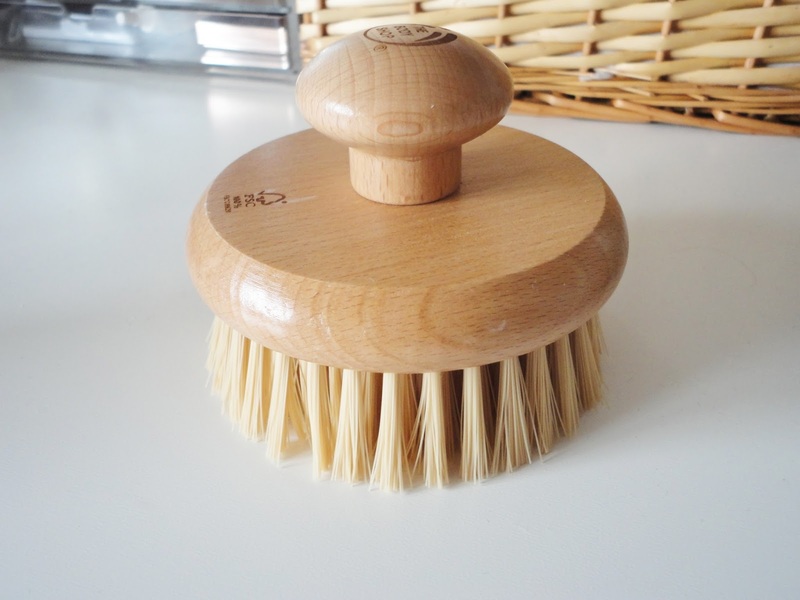 The bristles on this brush are great - body brushes should have fairly stiff natural bristles. I have to say, I'm not sure how good this would be for those with sensitive skin, as it does feel a bit weird when you first do it, and it does leave your skin looking pink so if you do have sensitive skin, maybe try a super light hand if you want to give body brushing a go. I have to say, I've been converted to body brushing. It really is worth all the hype and it's so important to take care of the skin on your body, and this is a great way to make sure it's always exfoliated and smooth. I've found body brushing to be great at removing fake tan. I always have to scrub and scrub with exfoliators to get fake tan off, but the body brush makes light work of getting it off so I absolutely love it for that reason. Secondly, I've noticed a huge difference in the texture of my skin. It definitely feels much softer straight after brushing, but I've also noticed the skin on the back of my arms is smoother. I often get the 'chicken skin' on the backs of my arms with little bumps etc, and body brushing has really helped to improve this. I also know body brushing is supposed to be fantastic for cellulite, but as I don't really suffer from this right now, I can't confirm whether it does or not, but I imagine the motion of the circular movements and bringing the blood to the surface, I can see how it would work. Have you tried body brushing? What do you think of it?